Ketogenic diets as an adjuvant cancer therapy: History and potential mechanism. Although no severe adverse changes have been reported with long term consumption of a ketogenic diet, renal damage due to excretion of nitrogenous waste products is also a possible side effect . While no studies report absolute renal damage associated with ketogenic diet use, 6% of cases involving children with intractable epilepsy have reported the presence of kidney stones following eating the ketogenic diet for 1–5 years [75,76]. Most studies that examine the adverse effects of ketogenic diets have been done in children with epilepsy that had prolonged consumption of the diet over a period of 1–6 years. Most adverse effects reported in children only occur in patients who are on the ketogenic diet for greater than 1 year and include hypertriglyceridemia, decreased growth (decreased levels of insulin-like growth factor–1) and progressive bone mineral content loss. 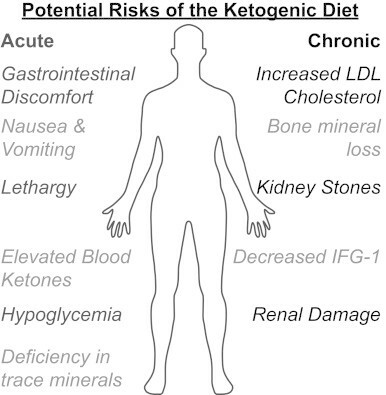 In addition, the most serious adverse effects of ketogenic diets can be prevented or corrected with appropriate measures such as vitamin supplements, assessment of bone function, and use of oral potassium citrate to decrease the risk of kidney stones [76,77]. In contrast, studies of ketogenic diets in adults show fewer and more minor adverse effects. In a 6-month study of adults on low-carbohydrate ketogenic diets, the only adverse effects noted were an increase in low-density lipoprotein (LDL) cholesterol levels, shakiness, and uneasiness . In another trial, only 3 out of 72 adult patients on ketogenic diets for 1 year had adverse effects, with two showing elevated LDL cholesterol and one developing a kidney stone . Another expected change associated with ketogenic diets is elevated blood ketones. This raises some concern in diabetic patients who are at an increased risk of developing ketoacidosis, a potentially life-threatening condition. 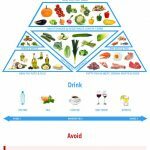 However, the level of blood ketones as a result of ketogenic diet use in most adult patients is modest and is not accompanied with high blood glucose and therefore presents a low risk for ketoacidosis. Most cancer therapies are designed to take advantage of the metabolic and physiological differences that exist between cancer cells and normal cells. Compared to normal cells, cancer cells exhibit increased glucose metabolism as well as alterations in mitochondrial oxidative metabolism that are believed to be the result of chronic metabolic oxidative stress [3,4,45] (Fig. 2). Mitochondria are involved in the regulation of cellular energy production through the process of oxidative phosphorylation where electron transport chain (ETC) activity is used in the generation of cellular ATP . In the mitochondrial ETC, electrons are shuttled down complexes I–IV, resulting in the generation of transmembrane proton gradient that is coupled to ATP production through ATP synthase (Complex V). Studies have shown increased prevalence of mitochondrial DNA mutations as well as alterations in the expression of nuclear encoded mitochondrial proteins in many human cancers [47–49] including head and neck , prostate , ovary , and liver cancers . Previous data suggests that the susceptibility of mitochondrial DNA to mutations is largely due to the increase in ROS levels in this organelle [6,49,54–57]. Furthermore, recent studies have shown that breast and colon cancer cells demonstrate significantly increased steady-state levels of ROS relative to normal colon and breast cells . These differences were even more pronounced in the presence of mitochondrial ETC blockers, suggesting dysfunctional mitochondrial ETCs as the major source of elevated ROS production in cancer cells . 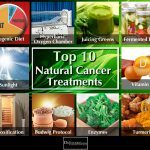 Overall, there is substantial literature indicating that there is a significant increase in intracellular O2•− and H2O2 in cancer cell mitochondria relative to normal cells and that this could represent a target for enhancing cancer therapy [5,7,9–14,16,17]. 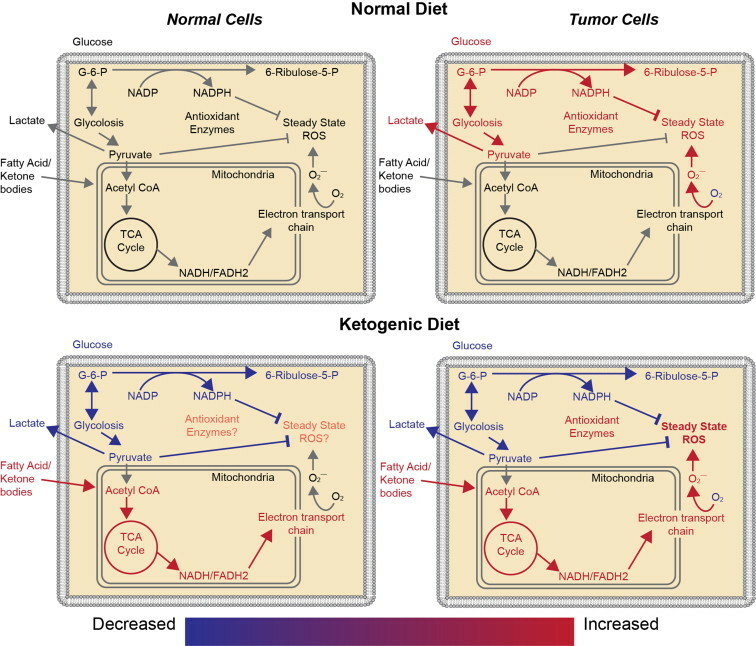 Comparison of normal cell and tumor cell metabolism on an American diet and a ketogenic diet. Relative to normal cells, tumor cells have been hypothesized to have increased mitochondrial DNA mutations as well as alterations in the expression of nuclear encoded mitochondrial proteins, resulting in increased production of reactive oxygen species (ROS) during mitochondrial respiration. Increased tumor cell ROS increases tumor cell dependence upon glucose metabolism, resulting in generation of NADPH and pyruvate via the pentose phosphate shunt and pyruvate from glycolysis. NADPH and pyruvate reduce hydroperoxides. Ketogenic diets decrease the capability of tumor cells to produce NADPH because, in most tissues, fat metabolism is unable to undergo gluconeogenesis to form glucose-6-phosphate (G-6-P) necessary to enter the pentose phosphate shunt. Thus, ketogenic diets should further increase the oxidative stress in tumor cells relative to normal cells by limiting NADPH regeneration. Fruit monodiet is the best way to restore antioxidant property of cells- Johanna Brandt’s Grape Cure.